Next was the demo of Project ThinApp Factory (love how they refuse to call it an app store ). This demo was much more interesting and is very exciting, as it will be using ThinApp and Horizon to extract your applications from your windows systems and move them into an application portal where you can provision the applications to your users. This also enables you to access these applications via your mobile device with the Horizon Application Manager and Horizon mobile. LG and Samsung are already working with VMware to enable horizon mobile on their devices and supposedly a load more are due in the future. Steve then mentioned what i think was the announcement of the keynote and it was Project Octopus. Where you can offer a corporate DropBox style repository to your users and your clients. It will supposedly be available via the public and private cloud and will have a load of security enhancements and features to keep your companies security team happy in the knowledge that only the correct people will be able to access the applications. You can sign up now for news and the beta of project Octopus here. There is more talk about new features that were released with vSphere5 from auto deploy to the “monster VM” capabilities that vSphere5 has now enabled. I’m not going to really cover these as there’s loads of resources out there about the new features due to it being released last week before VMworld. One part of the new features that was very interesting though was the announcement of the VXLAN which will allow encapsulation of L2packets into L3 packets and will supposedly remedy the identifier=location problems. I have to be honest I’m not very much of a networking guru and so this is something I’m going to need to read up more on before i can fully understand it’s capabilities. VMware have however submitted the specification to the IETF here for those who are more networking based and might understand it a lot better than what I do. Steve then announces SRM 5 and its new capability of automated Failback and uses the recent hurricane Irene in the US as a great example of the benefits of having a technology like this. You can read more about SRM 5 here. I’m not going to attempt to cover it, as there’s a fair amount of features that come with it and it’s easier to go through the datasheet of it than my repeating what is already covered in there. Lastly, Steve goes into vShield 5 and the changes and enhancements that are now available with the new release. The biggest part for my out of this is the news that vShield App will now incorporate DLP technologies (via RSA) to enable additional protection. Well that’s all the big news out of VMworld that caught my interest. Categories: Virtualisation | Tags: Horizon, Horizon Mobile, iPad, Las Vegas, Monster VM, octopus, Project AppBlast, SRM 5, ThinApp Factory, VMware, VMware Go, VMworld 2011, VMWorld keynote, VSA, vShield, vSphere 5, VXLAN | Permalink. First has to be a number of postings covered by Vladan Seget of Vladan.fr fame as he has already posted some great postings about announcements happening at VMworld. His first is all about the announcement by vKernel of their new version of their flagship product vOps- vKernel Operations Suite. Vladan has detailed all the new features in his blog posting so have a read through it as it looks to be an amazing product. Second is his covering of the announcement that David M Davis and Elias Khnaser have now released their VMware vSphere 5 Trainsignal videos. As I’ve mentioned numerous times and even in my review of one of David videos yesterday I really enjoy these videos and owe a large portion of my passing of my VCP4 to David’s videos. So I cant wait to get my hands on this new set especially seeing as I’m going to need to know it not just for my daily job but also for my eventual upgrading of my VCAP’s to version 5. Talking of vSphere 5 certifications Vladan covered that the registration for the VCP5 exams are now open. 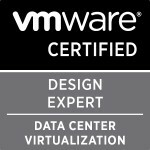 I’m hoping that the rumours of being able to achieve the VCP5 automatically by upgrading my VCAP exams are true but as I say those aren’t confirmed as yet. Next is all the great sites and links that can be used to keep up with all the latest news from VMworld US. You can register and watch Paul Maritz’s keynote and Steve Herrods session today here if you possibly miss it like I did Paul’s last night. There is the live stream from VMworld with interviews and news and even a link to the Keynote by Steve Herrod the Chief Technology Officer and Senior Vice President of R&D for VMware from 8am-9:30am Vegas time tomorrow.Plus all the videos from the past few days so make sure you have a look at them all here and make sure you’re watching the keynote. There is also the VMware Community TV booth run by John Troyer and Alex Maier. These ones are my favourite as it covers all types of things from the vExpert daily podcast (where a number of the 2011 VMware vExperts give us their views on the announcements of the day and what they think it might mean to the future of virtualisation) to Mike Laverick’s Chinwags and the vChats by David Davis, Eric Siebert and Simon Seagrave. The schedule for it all and when it is happening can be found here. VMworldTV is also running again on YouTube and already there’s a number of videos up including Day1 Summary of VMworld 2011 in Vegas and the very exciting news that a load of us have all been waiting for that VMworld Hands-on Labs will be going public in 2012 (also it’s great to hear a fellow Saffa Mornay van der Walt ,Senior Director of R&D for VMware describing it all) . I really enjoyed the videos from VMworld TV last year as they covered loads of the great news really quickly allowing me to get a very good high level view of the things happening and then I could further research the things I wanted to know more about. Some of the top bloggers have given their perspective’s on the first day and even given their opinions on some of the sessions they attended. Duncan Epping of Yellow-bricks.com fame posted all about his VMworld Day 1 experiences and gave some brilliant insight into his session with Frank Denneman (one I’m definitely planning to attend in Copenhagen) as well as other sessions he attended. Scott Lowe also blogged about Duncan and Franks session in his posting VSP1682: VMware vSphere Clustering Q&A. Scott also did a brilliant posting all about Monday’s General Session. Some amazing facts and figures mentioned in the General Session. Categories: Virtualisation | Tags: EMC, Trainsignal, Vegas, vExpert Spotlight, VMware, VMworld 2011, VMWorld keynote, vSphere 5 | Permalink. As you would expect day 1’s announcements were the biggest ones due to the keynote speeches and it being the first real day of VMworld.But even so there was still some really interesting news coming out yesterday , some additional information about previous announcements and an exclusive video of an iPad application. First just due to it being a really exciting application and another tick on my list of why I feel I need to get my hands on an iPad is the exclusive video of the vSphere Management app for the iPad. I’ve pasted the video below and don’t hold me to this but Duco Jaspars of www.vconsult.nl/ has said he has been told first hand by Srinivas Krishnamurti, (the guy in the video) that the ETA for the iPad vCenter client is VMworld Europe.I really hope he’s right but it does beg the question as many people I follow twitter have commented , when is the client for Macs coming out seeing as they can do one for the iPad. I’m not a Mac fanboy myself so it doesn’t bother me too much but if VMware want to keep all the Fanboy’s happy surely making a client is a good idea? *Update*Eric sloof pointed out that if you look carefully you can see he is using ESX 5.0. .So much for no more ESX after vSphere 4.1? Next is the video with Steve Herrod VMware’s CTO where he explains all the new acquisitions VMware has made and are planning to make in the future. A very very interesting interview and I always like to hear where companies like VMware see a need to grow and strengthen and what new technologies they are looking at. Next are two videos also from the VMworld TV’s YouTube channel (yes I really am enjoying these videos and it’s a nice rest bite from reading blog after blog) with their review of “day 3 at VMworld” and for those of us who are still puzzled as to why VMware bought Zimbra their VP (Zimbra’s that is) explains what VMware is doing with their products. Natan Linder, Masters student in the Fluid Interfaces Group at MIT Media Lab, will provide a glimpse into his work that fuses design and engineering to create novel human experiences, such as the reinvention of traditional items, evolved into a new category of robotic, digital information devices. Tan Le, co-founder and president of Emotiv Systems, will engage you with live demonstrations of a new form of remote control that uses brain waves to control digital devices and digital media. Next is a great summary of all the other announcements and ones I left out of my list seeing as they are described here by John Rath of datacenterknowledge.com from day 3(my day 2) of VMworld. Last is just a geek fact posted on twitter by Duncan Epping of Yellowbricks.com fame which shows the sheer size of the VMworld labs: “112166 VMs deployed at the #vmworld labs, that is more in 3 days than Citrix managed to deploy over the last 3 years.” *I don’t know about the Citrix claim so don’t quote me on it or send me hate mail, I’m just reposting his tweet 🙂 * Also it was great to see my last posting for All Things VMworld:Day 1 getting onto the official VMworld buzz page :). 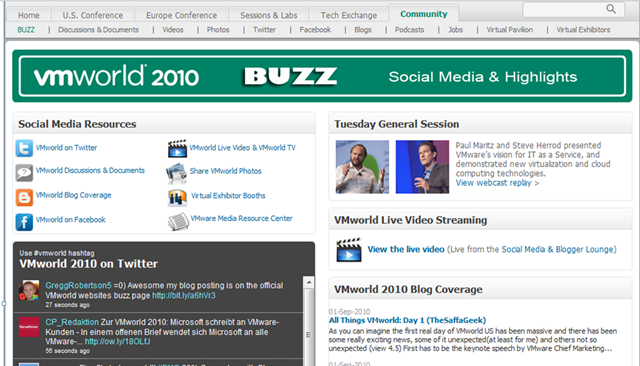 Yes I got the screenshot as my tweet about being on the page was also in the VMworld 2010 on Twitter stream. Categories: Virtualisation | Tags: iPad vSphere management app video, VCD, VMware, VMware View 4.5, VMworld, VMworld 2010, VMWorld keynote, Zimbra | Permalink. As I said one of the not so unexpected announcements was the announcement that the latest version of VMware View, version 4.5 is not available. Chris Wolf from Gartner has done a brilliant review of the new version on his blog here. As I mentioned yesterday one of the big announcements was the release of vCloud Director (VCD). Rodney Haywood has done a great posting all about it seeing as he is part of a major deployment of VCD in Australia and therefore already has a great working knowledge of the product. You can also now download VCD from the VMware website and as Rodney says “build an internal or public cloud (subject to licensing programs of course)”. Barry Coombs has done a great posting about the Xsigo announcements at VMworld. I’ve only read a few articles on Xsigo myself so it good to learn more from his posting and hear about the new products being launched. Scott Lowe has also done a very good liveblog posting for the View Composer Technical Deep Dive and Best Practices session.From my brief read of the posting it looks like the session was very very interesting and i plan to read through his posting a few times when I have a moment. Last is his posting all about the EMC VPLEX and how VMworld attendees “can try VPLEX (it’s in the EMC hands-on-lab on the show floor), and can try it for 90 days” I’m very jealous of this as a number of the vSpecialists I’m friendly with have been working and testing the product and sadly I am yet to have fiddled with it myself. Hopefully i can get some time with it at the VMworld in Europe if they are still doing it, which I would be amazed if they weren’t. Also he mentions the preview of VPLEX Geo – aka vTeleportation and has posted a video of the preview which is really awesome in my opinion (no not because I work for EMC at all, seriously). Have a look at the video on the blog and tell me you aren’t impressed and excited by what it will allow. Well that’s my list of things that I feel I need to read up on and that have caught my attention. Flickr Tags: VMworld,VMworld 2010,VPLEX,View 4.5,VMware,DRS for storage,vTeleportation,EMC,VMWorld keynote,VPLEX Geo. Technorati Tags: VMworld,VMworld 2010,VPLEX,View 4.5,VMware,DRS for storage,vTeleportation,EMC,VMWorld keynote,VPLEX Geo. Categories: Virtualisation | Tags: DRS for storage, EMC, View 4.5, VMware, VMworld, VMworld 2010, VMWorld keynote, VPLEX, VPLEX Geo., vTeleportation | Permalink.